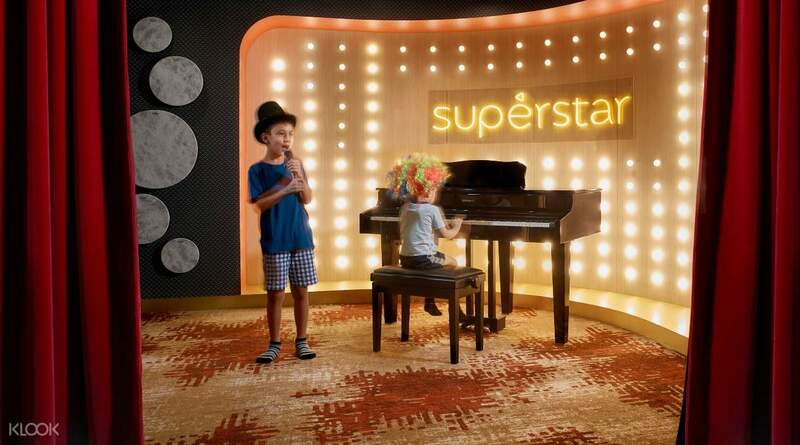 Book through Klook and get to bond with your children at this immersive play space created by Shangri-La Hotel! great place to be! lots of areas to explore with different theme. suitable for both young toddlers and older kids. we bought the stage play and muddy play. kids prefer muddy play with paint though. klook package made the trip more worth! Are you embarking on a trip to Singapore and looking for a fun place where your children can develop their dormant talents, as well as pick up some important life skills? You’ve found the perfect experience! 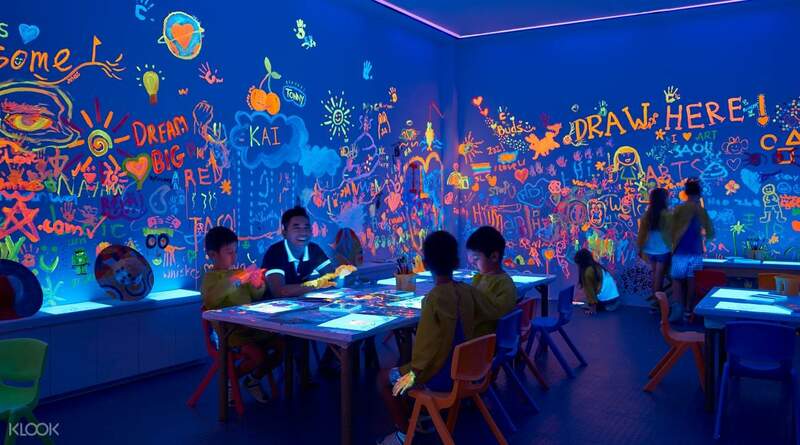 Book through Klook and visit Buds by Shangri-La, an immersive and curated space that houses multiple play zones with engaging activities that encourage learning through play! There are general play areas where your children can play and mingle with other children with various play elements such as slides, a jungle gym, and pools with balls! There are also activity zones that promote learning and creativity, such as: 1) Stage, where children can try their hand at playing the drums, the piano, and singing; 2) Muddy, where they can paint on the walls and enliven the place with vivid colors and images; 3) Bake, where they’ll learn how to bake their own treats! 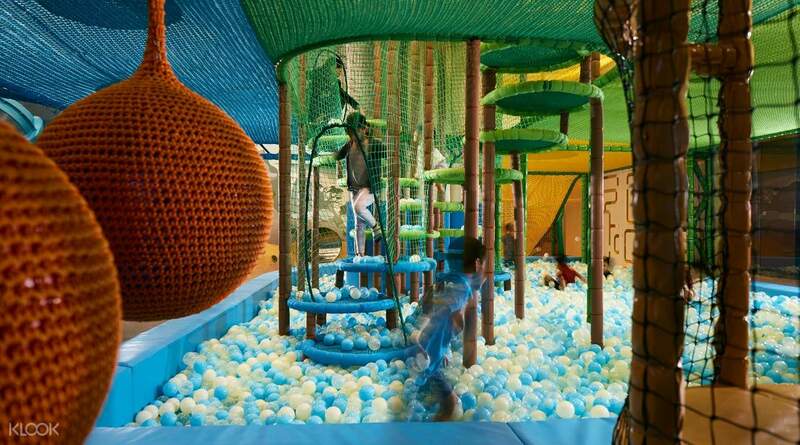 Treat your children to a fun-filled day at Buds by Shangri-La, a must-visit for anyone looking to have their children play, learn and have a memorable experience in Singapore that they will never forget! 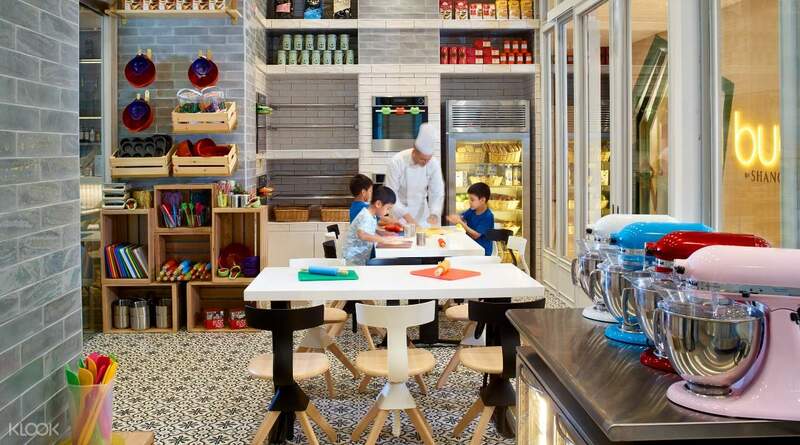 Book through Klook and have your kids partake in a learning experience through play at Buds by Shangri-La! It was a great experience going to Buds with my 2.5 year old son and his 7 year old Cousin. Booking it via Klook definitely saved us money as well (usual prices in attached photo). We booked for a 10am slot on Saturday which was during the peak period but the crowd was fairly manageable as the whole area was very spacious for the kids to run around. Unfortunately our kid was too young for muddy play (ages 4 and up). His cousin took part; this play area lasts about 45mins, including storytelling and decorating a snowman for the Christmas season. It is an independent activity where we left her alone with the friendly staff. We loved the toddler area with the gentle slide and ball pit. The area is separate from where the older kids are playing and is well padded at all areas making it safer for toddlers and infants. There was also a separate “sand pit” with sand made of tiny seeds/ synthetic material which was clean and did not cling to our clothes. Although the main area is meant for older children, our son managed to play on the higher slides and ball pit with the help of his Cousin. There was enough space for the older kids to run around the younger ones who may take a little longer to climb up the structures. Staff were also positioned at the ‘harder’ sections such as the fireman’s pole to guide kids down safely. These safety considerations were reassuring. Additionally, there seemed to be staff “minders” for children with no accompanying parents. With the cafe within the area for refreshments and the well equipped nursing room just outside Buds, it was a very enjoyable experience especially for families with children on multiple ages! For the quality and variety of play areas available and the price discount via Klook website, I will definitely go back again! It was a great experience going to Buds with my 2.5 year old son and his 7 year old Cousin. Booking it via Klook definitely saved us money as well (usual prices in attached photo). We booked for a 10am slot on Saturday which was during the peak period but the crowd was fairly manageable as the whole area was very spacious for the kids to run around. Unfortunately our kid was too young for muddy play (ages 4 and up). His cousin took part; this play area lasts about 45mins, including storytelling and decorating a snowman for the Christmas season. It is an independent activity where we left her alone with the friendly staff. We loved the toddler area with the gentle slide and ball pit. The area is separate from where the older kids are playing and is well padded at all areas making it safer for toddlers and infants. There was also a separate “sand pit” with sand made of tiny seeds/ synthetic material which was clean and did not cling to our clothes. Although the main area is meant for older children, our son managed to play on the higher slides and ball pit with the help of his Cousin. There was enough space for the older kids to run around the younger ones who may take a little longer to climb up the structures. Staff were also positioned at the ‘harder’ sections such as the fireman’s pole to guide kids down safely. These safety considerations were reassuring. Additionally, there seemed to be staff “minders” for children with no accompanying parents. With the cafe within the area for refreshments and the well equipped nursing room just outside Buds, it was a very enjoyable experience especially for families with children on multiple ages! For the quality and variety of play areas available and the price discount via Klook website, I will definitely go back again! Located behind THE LINE. Colourful net play area. Friendly and ample staff.clean toilet. Separate play area for 4 yo and above & less than 4 yo. Limit to 3 hrs play time including 1 hr muddy. Small cafe inside bud- not knowing this otherwise would have taken my lunch here . Kids menu price reasonable. able to gain entry to kids pirate ship playground and splash area (required swimsuit) behind a distance away. Located behind THE LINE. Colourful net play area. Friendly and ample staff.clean toilet. Separate play area for 4 yo and above & less than 4 yo. Limit to 3 hrs play time including 1 hr muddy. Small cafe inside bud- not knowing this otherwise would have taken my lunch here . Kids menu price reasonable. able to gain entry to kids pirate ship playground and splash area (required swimsuit) behind a distance away. great place to be! lots of areas to explore with different theme. suitable for both young toddlers and older kids. we bought the stage play and muddy play. kids prefer muddy play with paint though. klook package made the trip more worth! great place to be! lots of areas to explore with different theme. suitable for both young toddlers and older kids. we bought the stage play and muddy play. kids prefer muddy play with paint though. klook package made the trip more worth! Great place to bring babies and toddlers to! :) My son and nephew had so much fun at the large playground and the 'muddy' activity (painting their own little Christmas tree (which can be brought home!) and listening to a story). Highly recommended to all parents!! Great place to bring babies and toddlers to! :) My son and nephew had so much fun at the large playground and the 'muddy' activity (painting their own little Christmas tree (which can be brought home!) and listening to a story). Highly recommended to all parents!! My 11 yo and her friend went for the 1.5h Christmas brownie baking activity and absolutely loved it. I could observe the activity through the glass doors and see that chef Candy and Mai made sure the girls practised good hygiene - there was a lot of hand washing! The kids were hands-on all the way, making the brownies and decorating them with guidance. They told me afterwards that Candy & Mai were patient and kind, and chatted and joked with them to make them feel at ease. There was some mixup in the timing initially but Shangri-la emailed me immediately after my booking and we got it sorted out quickly. My 11 yo and her friend went for the 1.5h Christmas brownie baking activity and absolutely loved it. I could observe the activity through the glass doors and see that chef Candy and Mai made sure the girls practised good hygiene - there was a lot of hand washing! The kids were hands-on all the way, making the brownies and decorating them with guidance. They told me afterwards that Candy & Mai were patient and kind, and chatted and joked with them to make them feel at ease. There was some mixup in the timing initially but Shangri-la emailed me immediately after my booking and we got it sorted out quickly. Booking experience was perfect. No issues faced at all. Went for the Muddy play workshop and my 2 children made a snowman. Originally thought they only had 1hr playtime at the play area after that but was pleasantly surprised that our entry was for a total of 3 hrs including the Muddy workshop. Children had lots of fun and were still reluctant to leave at the end. A cafe within the premise gave us parents a place to chill and have coffee. It wasn’t obvious but I’m glad we asked... we were also allowed to enter the outdoor playground managed by Shangri-La which was some distance away from the Buds playground. This included a pirate playground and a water playground where the children played for another hr. A fun outing for them! Booking experience was perfect. No issues faced at all. Went for the Muddy play workshop and my 2 children made a snowman. Originally thought they only had 1hr playtime at the play area after that but was pleasantly surprised that our entry was for a total of 3 hrs including the Muddy workshop. Children had lots of fun and were still reluctant to leave at the end. A cafe within the premise gave us parents a place to chill and have coffee. It wasn’t obvious but I’m glad we asked... we were also allowed to enter the outdoor playground managed by Shangri-La which was some distance away from the Buds playground. This included a pirate playground and a water playground where the children played for another hr. A fun outing for them! Great way to spend a few hours. Buds is a safe, clean and well-lit play area with both water play and indoor play. My kids loved it, even the eldest aged 9 wasn’t bored. Saved tons with Klook, only slight problem was redemption. Buds reception couldn’t find our registration, so needed to forward them the email with the voucher. Great way to spend a few hours. Buds is a safe, clean and well-lit play area with both water play and indoor play. My kids loved it, even the eldest aged 9 wasn’t bored. Saved tons with Klook, only slight problem was redemption. Buds reception couldn’t find our registration, so needed to forward them the email with the voucher. its not crowded in the afternoon. nice big indoor playground for the kids to spend for hours. the girls love the stage play where they learnt how to dance for the crowd. great place to go to. its not crowded in the afternoon. nice big indoor playground for the kids to spend for hours. the girls love the stage play where they learnt how to dance for the crowd. great place to go to. It’s such a wonderful first experience for both me and my 5yo! He loved the place absolutely and getting into the playground with klook voucher was easy. It’s just a pity that 1 hour is too little! Haha. We even had a DIY Xmas sock souvenir to bring home as a keepsake :) lastly we ended the day with water play! He enjoyed himself so much and even me too. The service staff are all awesome ! It’s such a wonderful first experience for both me and my 5yo! He loved the place absolutely and getting into the playground with klook voucher was easy. It’s just a pity that 1 hour is too little! Haha. We even had a DIY Xmas sock souvenir to bring home as a keepsake :) lastly we ended the day with water play! He enjoyed himself so much and even me too. The service staff are all awesome ! My child and I both enjoyed this outing very much! I could relax at the cafe knowing that she is in an environment that was safe, with staff around keeping watch. The staff were friendly and helpful. The space was very well planned, my child could easily find me when she needed to. Very nicely done up and very clean. A very good deal from Klook! My child and I both enjoyed this outing very much! I could relax at the cafe knowing that she is in an environment that was safe, with staff around keeping watch. The staff were friendly and helpful. The space was very well planned, my child could easily find me when she needed to. Very nicely done up and very clean. A very good deal from Klook!